The Arizona Wildfire Risk Assessment Portal (AZ WRAP) will be the primary mechanism for the Arizona State Forestry to deploy wildfire risk information and create awareness about wildfire issues across the state. It is comprised of a suite of applications tailored to support specific workflow and information requirements for the public, local community groups, private landowners, government officials, hazard-mitigation planners, and wildland fire managers. Collectively these applications provide the baseline information needed to support mitigation and prevention efforts across the state. The Oregon Department of Forestry (ODF), on behalf of the Council of Western State Foresters (CWSF) and the Western Forestry Leadership Coalition (WFLC), conducted a wildfire risk assessment and report for the 17 western states and selected U.S. affiliated Pacific Islands. At the highest level, this assessment completed in 2013 is known as the West Wide Wildfire Risk Assessment, or WWA. 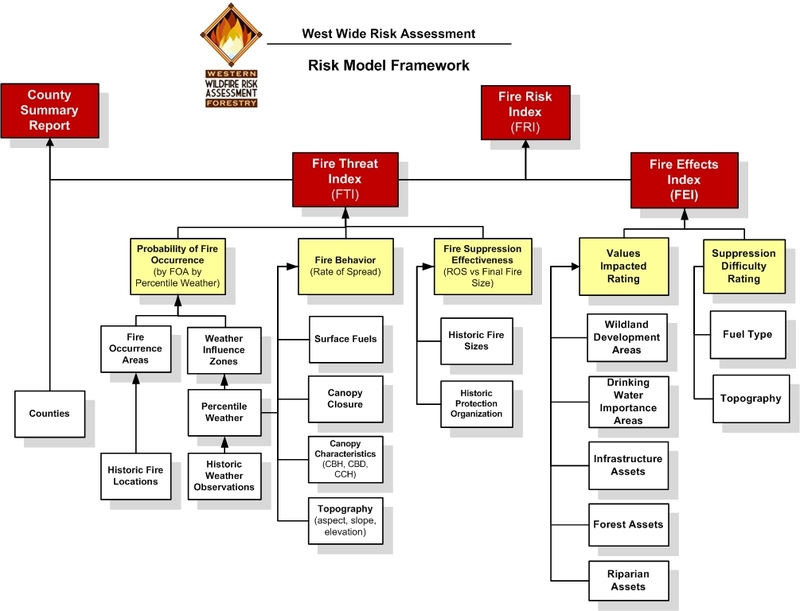 The basic risk assessment model used in the West Wide Wildfire Risk Assessment includes three primary outputs: the Fire Risk Index, the Fire Threat Index and the Fire Effects Index. Webster’s dictionary defines risk as “the possibility of suffering harm or loss.” Within the WWA, the data layer that defines wildland fire risk is the Fire Risk Index (FRI), while the “possibility of suffering harm or loss” is represented by the Fire Threat Index (possibility) and the Fire Effects Index (harm or loss). The Fire Risk Index is calculated from the Fire Threat Index (FTI) and the Fire Effects Index (FEI).